The British Olympic Association (BOA) and the International Olympic Committee (IOC) have awarded former MDX student, James-Andrew Davis and current MDX student Cyrille Tchatchet II, a monthly bursary in the build-up to the Tokyo games in 2020. James and Cyrille are two of nine athletes that were selected as part of The Olympic Solidarity programme to receive funds, which was created to assist athletes in their preparation for the Games. Former MDX sport and exercise student James-Andrew Davis started fencing aged four, becoming Britain’s first ever fencing European Champion in 2014. He has since represented the British team at the London 2012 Olympics – going on to secure a World Ranking of 6th in 2016 after representing GB at the Rio Olympics among other achievements. 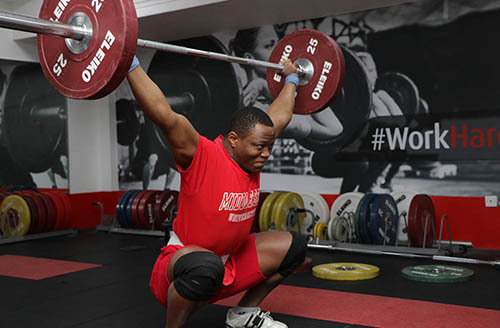 Cyrille’s love of weightlifting brought him from his native Cameroon to the UK to compete in the Commonwealth Games in 2014. When he was awarded asylum in 2016 he began studying nursing with a focus on mental health at MDX. Cyrille will receive $1,500 per month as part of the refugee athlete support programme, which will help him prepare and participate in high-level competition. Athletes who are part of this refugee programme will be considered to compete at the next Olympic Games. On behalf of the whole #TeamMDX community - good luck in your training, Cyrille and James-Andrew!